The boarding house Nika is located in the town Rosice nearby Brno. This town is interesting by several historical monuments and it also lies on one of several cycle routes. That ‘s why is the boarding house Nika the suitable accommodation on your pilgrimage discovery tour. The major monument of the town is the Chateaux up the hill above where the Bobrava river meets the Říčasnký potok. The local castle was rebuilt into a chateaux probably during the Petrold z Lipé period. The further rebuild into a renaissance style was done during Žerotín ‘s period in the 17th century. The last private owner was Mořic Arnold baron Deforest – Bischofsheim. Then was this chateaux nationalized. In these days there is a seat of local library and exposition with postcards and letters. There is a Saint Martin temple in the ex – graveyard. The church is built in the combination of gothic and renaissance style. But the romance style of windows shows the different age of the church. Other significant monument is pilgrimage church of the Saint Representatives located on the south hill of the town. The church was settled by the owner of Rosice court Jiří Hrausperský of Fanal in the 18th century. To the church leads lime tree street with calvary road officially registered as The Lime line of trees in Rosice. There is a fountain with the statue of Slavic God Živěna. The fountain was installed in 1868 to the occasion of opening the first town water supplier. The fountain comes from Brno, where was standing on Lidická street. Under the town hall is standing old public pillorying, which has not been used anymore since 1752 when the local court was canceled. It was built at the current place in 1959. 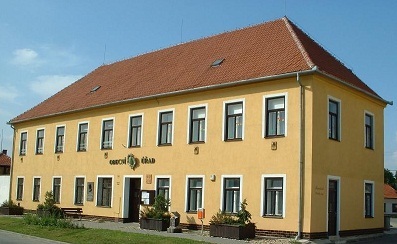 There is also a seat of apiculture museum with the library of Czech union of apiculture breeders and apiculture breeding station. The old commemorative pear tree grows in the filed under the fenced area. This tree is also written in the list of commemorative trees as The Pear tree under the fenced area. You can find the memorial in the town Ostrovačice, approx. 6km from Rosice, where is the boarding house Nika. To the memorial is possible to walk, go by car or ride a bike on the cycle route. And thence following the red tourist mark you can go to Podkomorská myslivna. Podkomorská myslivna is the place where lived Helenka, the girl from the novel Pohádka máje (The fairytale of May) written by Czech writer Mrštík. It is also a place where lived the real forester ‘s daughter Helenka Nováčková. That ‘s why is this place favorite tourist attraction and also that ‘s why is there a little museum with the memorial of Mrštík ‘s reference. There is a marbling statue of Helenka in front of “myslivna” (hunter house). The statue was created by Emil Hlavica. 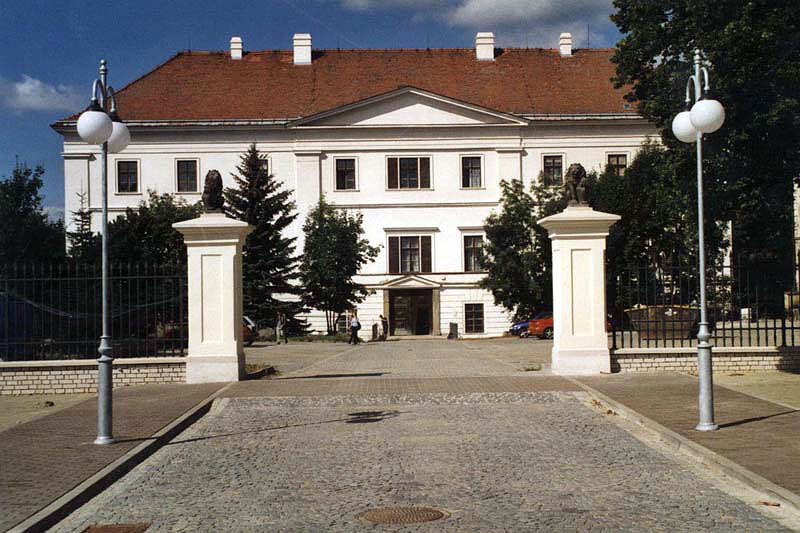 The museum has moved to the town Ostrovačice since 2002. There is a nature reserve in the wildlife park Podkomorské lesy. The wildlife park Podkomorské lesy is the home of Pohádka máje. The park is created with large – scaled high plateau with the average altitude 450 meters above sea level. The major part of the territory is created with deciduous oak – hornbeam forests. 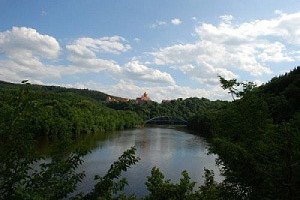 There is also a large part of Brno reservoir and the Castle Veveří. 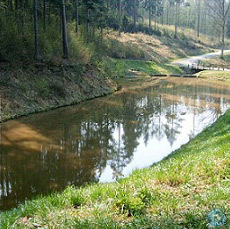 The park is criss – crossed by a dense network of forest streams and little streams in the basin of the river Svratka. There are also springs (The well known is Helenčina studánka - Helena’s spring and Rišova studánka - Riša ‘s spring) and spring waters with drinking water. The park offers its beauty in every season. You can find here a lot of ways and paths, which attract you to walk there or ride a bike or to do cross country skiing in winter. The park is really close to the town Rosice, that ‘s why is the boarding house Nika the best way to stay. About 10km from the town Rosice, where is located the boarding house Nika, stands 22 metres high modern watchtower, which was newly built instead of the old wooden watchtower. 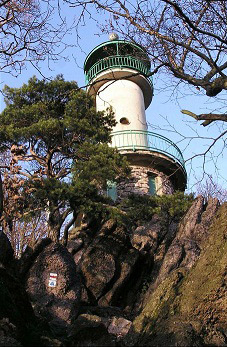 The old wooden watchtower was standing there between years 1910 and 1938. The new watchtower is called after native actor Vladimír Menšík who lived in the near town Ivančice. 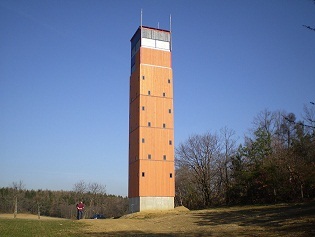 This watchtower was opened in 2007. The watchtower belongs to the favorite tourist attractions because of its location in the village Hlína, by the top of Bučinské polesí. You can have a view of South Moravia, Pálava hills and under good weather conditions you can see Bílé Karpaty and Alps. Hlinská vrchovina (Hlina highland) lies on the node of cyclo routes and tourist paths network. The most significant relaxing and recreational area in Brno. It was built between years 1936 – 1940 in order to regulate the flow of Svratka river to prevent floods. 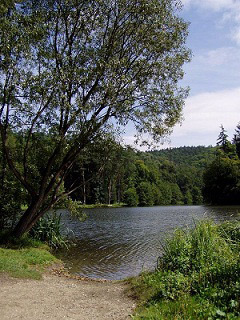 The reservoir lies north – west of Brno in a beautiful forest nature. There are also presented the Ignis Brunensis fireworks. Swimming is possible mostly only in spring and at the beginning of summer because of cyanobacteria. You can use plenty of sport activities, also in winter when is the reservoir changing into a huge ice skating rink. It is also a connection road for cross country skiing. There is the possibility of boat trip (streamer trip). In the reservoir surrounding is located a lot of tourist paths and cycle routes. 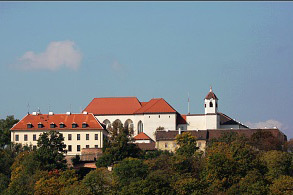 We recommend you to visit the castle Veveří. There was built a bridge across the reservoir for tourists and cyclists. The boarding house Nika is applied about 13 km, depends on which way you go to. It is one of the widest and oldest castle areas not only in Moravia but also in the Czech republic. It lies on the high rock above Brno reservoir, above the place where the River Svratka and the stream Veverka meets. The castle was built at the turn of 12th and 13th century as a small castle. The castle was growing and became the centre of noble court. After the war was the castle used inappropriately and it began its deterioration. But at the last time it has been renovated again. It is possible to visit the castle during the castle renovation as well. The visits are not traditional and the visitors can visit and see the places, where the renovation is processing. The exposition is then changed every year. The boarding house Nika is located about 13 km by car, but you can go there by bus as well (need to change the bus in Hvozdec or Veverská Bítýška. Of course is there the network of cycle routes and tourist paths. The most significant monument is Brno, situated above the centre of Brno, lies less than 20 km from the town Rosice, where is located the boarding house Nika. 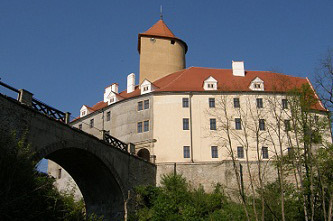 The casle was settled by Přemysl Otakar II. in the 13th century and it served to Moravian noble. In the 18th century, after huge rebuild, became the castle massive baroque fortress. After that the castle became the hardest prison of Austria monarchy and then military barracks and finally it became a museum. The barracks are the most visited place on Špilberk. But you can also visit the other expositions. The different performances are held during the summer months in the courtyard, e.g. concerts, theatre performances, historical battles, etc. Špilberk is definitely the place that you should visit and it is easy to go there by bus or by car from our boarding house Nika. 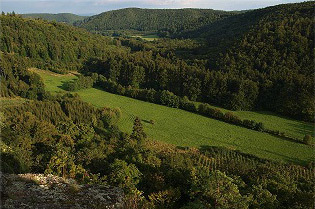 The nature lovers can visit protected countryside area in the Holásky surroundings south of Brno, 23 km from the town Rosice. 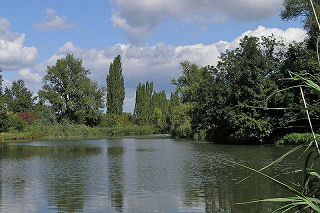 The region meets cycle route, which leads to Austria and there is also a possibility of fishing. The watchtower is located 521 meters above the sea level and it belongs to the favorite tourist sites. You can find beautiful nature there, various rocks and an amazing view into picturesque valley with the contours of the city Brno and Pálava hills in the background. You can find the watchtower close to the town Lelekovice, about 30 km from the town Rosice. Narrow and deep valley close to the town Bílovice nad Svitavou, which is called due to the author of the book Liška Bystrouška. You can find there small well and the memorial of Těsnohlídek, Lolek and Ressel. This favorite tourist site is approx. 30 km from the town Rosice, where is located the boarding house Nika. One of the nicest places belonging to Brno lies close to Líšeň, approx. 30 km from the town Rosice. Through the valley flows stream Říčka. There was built 5 man – made ponds. It is possible to ride a bike through the whole valley and have a little snack or lunch in some of several restaurants. There is also a lot of interesting things to see such as: Staré zámky, Hornek view, Hostěnické propadání, several mills, the caves Pekárna, Ochozká or Švédův stůl, the parts of Horákov castle, Mokerská or Horákovská myslivna (hunter house), Pacherův kříž, etc. For sure it is one of captivating places to visit. Not far from Brno, by the village Prace, approx. 34 km from the town Rosice, lies Mohyla míru – the memorial to commemorate war dead of Napoleon war. Napoleon won the war by Slavkov u Brna. 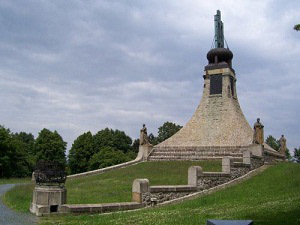 This memorial is the dominant of “místa světla” (the place of light) which turned the former battlefield in. The commemorative act to commemorate war victims is held there every year in November/December. You can also visit the multi – media non – traditional exhibition of the battle “Bitva Tří císařů”.